Inside: a glue dot worksheet to give kids practice controlling their glue bottles. Glue practice is also great for strengthening little hands and improving fine motor skills in general. 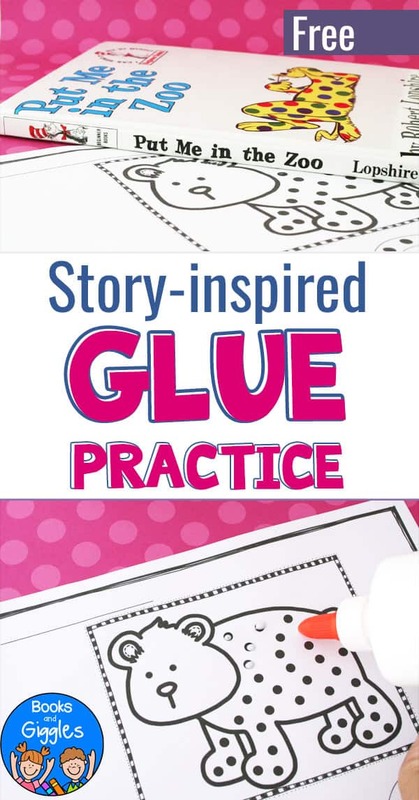 Here we’re sharing a special, story-inspired glue practice activity. As a fifth grade teacher, you assume your students will already be skilled at using glue. Yet, some kids don’t get glue practice in kindergarten, so even in fifth grade you’ll find yourself dealing with soggy worksheets drowned in glue, running out of glue before the winter break because of overzealous gluers, and rescuing at least one child who somehow managed to glue their shorts to their seat. This is why glue practice is so essential in the earlier grades. The entertaining story Too Much Glue (affiliate) by Jason Lefebvre, with lively illustrations by Zac Retz, is popular for introducing younger students to glue use. It’s about a boy who squeezes out “a gluey lake” and makes a huge, hilarious mess. It makes for an engaging opening to a lesson on how to use glue. When it’s time for additional practice, though, I have a fresh story suggestion. 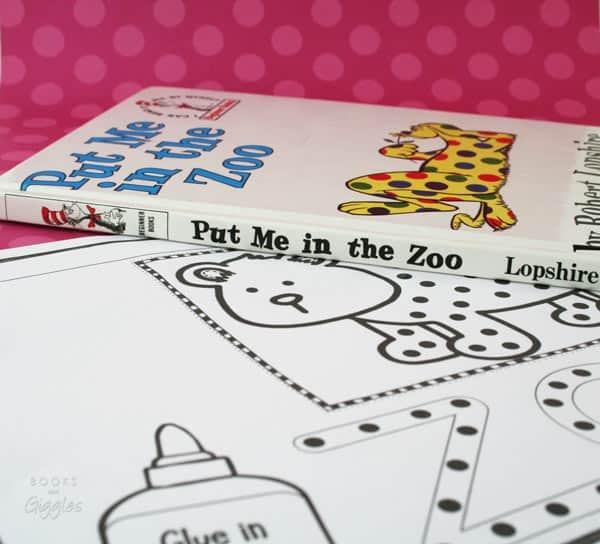 We love the classic early reader Put Me in the Zoo (affiliate) by Robert Lopshire. It’s about an animal with magical spots. He sees how well the animals in the zoo are treated, and wants to be put there too. 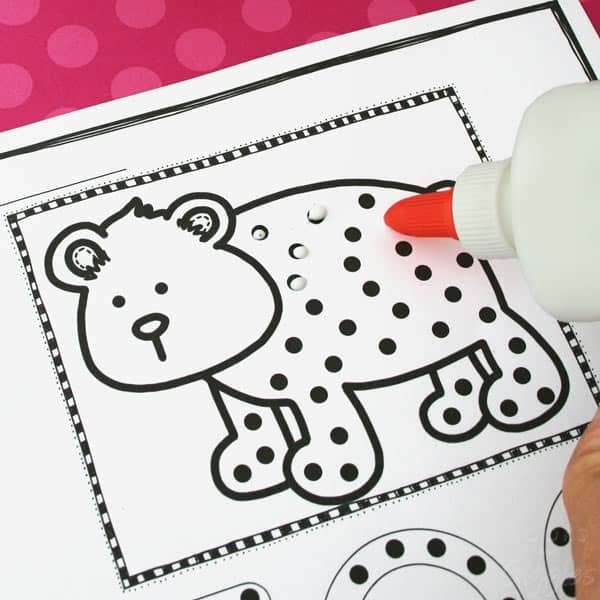 To go with the story, we made a cute printable glue dot worksheet that kids can add glue dots to. You can use regular glue, colored glue, or have fun with glitter glue. The idea is to get those little hands working the glue bottles well. 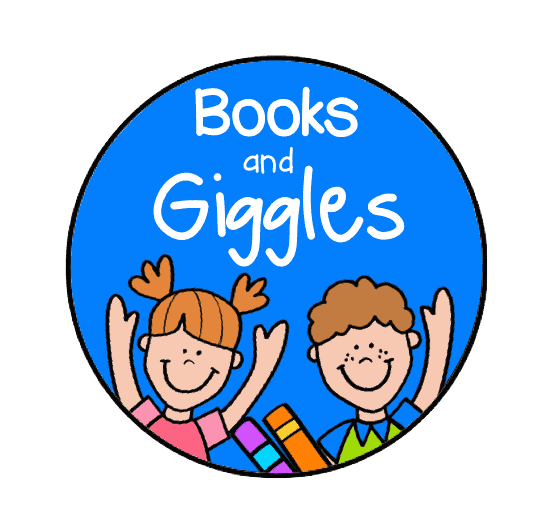 >>To grab your free copy, click on the blue Books and Giggles rectangle at the very bottom of this post. Have the kids put a dot of glue on all the dots printed on the worksheet. Let dry. You may like to point out how the smaller dots dry faster. My testers here at home gave this activity a big, glue-free thumbs up. They’re going to be pros even before school starts. 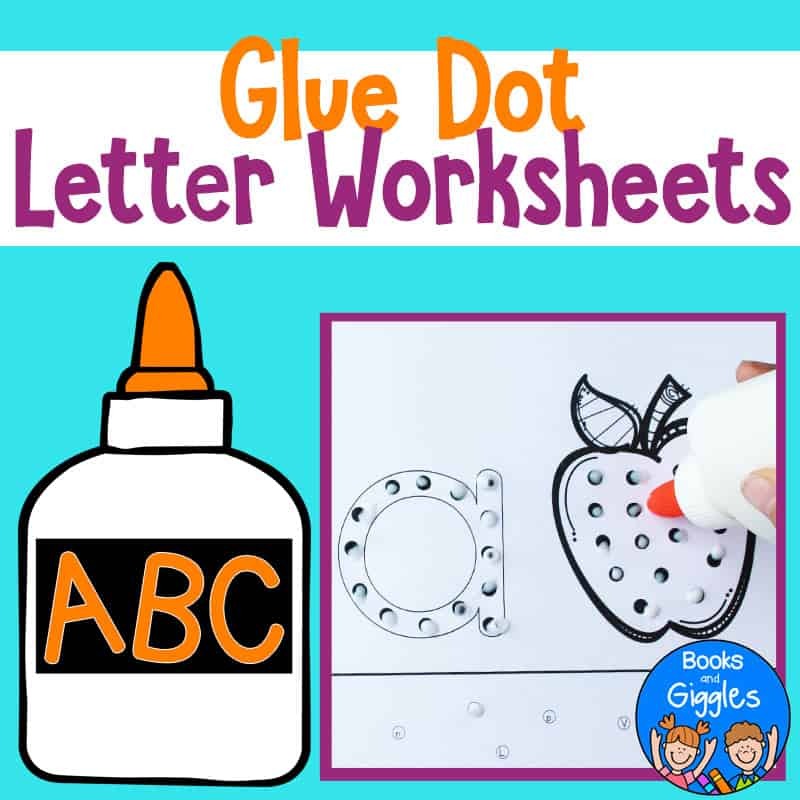 If you love this glue activity page, you may also want to buy a set of our Glue Dot Letter Worksheets. The printable pack includes all 26 letters (uppercase and lowercase), plus 4 pre-primer sight words. You can click on the link or picture to purchase it from my Teacher’s Pay Teachers store.